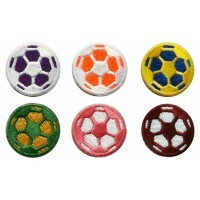 One each of White/Purple, White/ Fluorescent Orange, Gold/Blue, Green/Yellow, Pink, and Maroon soccer ball patches. This cost includes free standard USPS Shipping in the US. There are no quantity discounts for the patches sold on this page. These samples are specially packaged. Free Shipping in the U.S.